She took me for a spin up Emigration Canyon to thank me for changing her oil (RedLine 10/40 full synthetic race oil) & filter (Mobile M301a), and I gave her 6oz Archoil friction modifier and Archoil fuel additive (after E and I ran her out of gas a week ago to make sure all the old gas was gone). Good “blat’s” coming down, and growls all the way up. It takes some finesse on the clutch not to chirp the tires pulling away at stoplights. 289 D engine (same as the 302) 442 setup (4 barrel carburetor, 4 speed (five with reverse, jokers), 2 barrel exhaust. Vertical scratches: dog of prior owner. Horizontal Scratches: “cowboy pinstriping” of prior owner (fire-fighter) driving to remote fire sites. Plus, whatever dings I’ve added. And daisies. With E’s suby tricked out, and the bumpers redone on the Frontier (and I built a heat shielding platform behind the seats with aluminum faced foam-core as the twin tailpipes converge into one large pipe back there and bake the pets on road trips, half carpeted for Nora, and the other half covered with a wood platform with tie-downs for the cat carriers: that is, after getting under the truck and sleeving the tailpipes under the cab with 10 feet of heat shields); it was time for Paint Correction. The first time for the truck to have a real Paint Correction in her 15 years, and it took an hour for her every year old to complete, and maybe a bit more. Just cleaning the whole truck with a clay bar took many hours, as it kept giving up more and more yutz. Then I go section by section- roof, hood, cab side driver, cab side passenger, etc with each section taking 1.5 to 4 hours, timing the work for early morning or late afternoon to beat the near triple digit heat and keep the surface out of the sun. I use my pneumatic random orbital polisher with a cutting microfiber disk and cutting fluid to remove the heavy scratches and oxidation; next I switch to a polishing microfiber disk on the orbital with polishing fluid to shine her back out; and finally a polishing microfiber orbital disk with finish wax, and buff that off with a microfiber towel. I use Meguar’s fluids, as they invented the microfiber disk and proprietary fluids/compounds. I used Mother’s on the suby, and found the Meguar’s more responsive and less likely to overwork the paint as it is made to break down as it cuts which helps to indicate when the pad is dirty/the paint is clear. Same door, now with Nora checking her reflection. The color shifted because the dirty and oxidized clearcoat was cut clean, then cut clear of scratches, then polished back up, then waxed. Just the nose, door, and back leg of the cab took 4.5 hours to bring along. 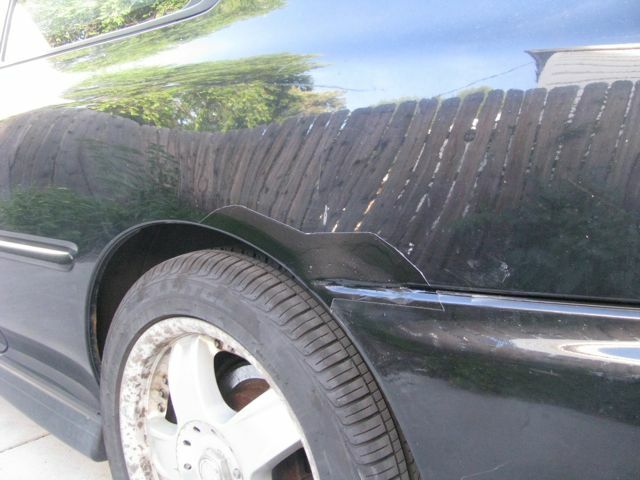 The blurry haze on the paint is all the scratches, plus some big gouges as well. It’s not your imagination, it really is a different color now. The cab took all morning, and a bit into the afternoon. At five pm, when the shadow of the house moves over the truck, I head out again for another 4 hours and do the roof of the shell and this passenger side of the bed. At 5% humidity the pads dry out fast, and I have to stop and blow them clean with the air nozzle, clear the haze of residue off the truck, then re-wet the pads with fluid and head back on. From an opposite angle, still clear. The nose and front flare, with a little pile of dirt on the bumper that vibrated loose from an infinite store of Montana that rides in every nook and cranny. Next I’ll see if my little jar of touch-up paint is still good, and clear up all the dings. The arts may collapse, but a good weld is a good weld. The trailer can fit two shipping containers. It is a beast. A buddy of mine has started a business as a trucker; his rig is a stout MAC tractor and this flatbed trailer. He lives up a steep winding road in Park City, and a neighbor lets him park the flatbed down at the bottom at a vacant lot. The underside railing of the trailer needed to be cut out and replaced. The outfit is too big turn on a city street, so we couldn’t use my shop. He picked up a nice little welder that would run on 110, but provide 140amps, and we lifted his big generator into the back of his truck and worked in-situ, or en-plein-air if we really want to be artsy about it. There are six tubes that span the underside, aligning with “flying buttresses” of pipe that support the width of the bed. Here I have replaced 3. It took all day. The prior owner of the trailer had covered five of the six rail pipe in carpet to stow things below. The pipes were severely corroded, and many of the welds had sheared. This would get his operation shut down at any inspection point. We cut out all the old pipe, all but the last pipe way down by the wheels as it hadn’t been carpeted and was fine. The inside diameter of the new pipe is bigger than the outside diameter of the old pipe- nice upgrade. Small shielded welding wire on a little welder hooked up to a generator that would pop its circuit if I made any mistake, coupled with gusty wind, made for tough welding conditions. The original pipes were all cut short to ensure their fit, then steel disks were welded on each sidewall of the big beams to gap in the pipe, and the pipes were welded to the disks. I ground out the pipe-weld, and re-welded to the big circular platforms. This took a lot of grinding… my birthday present Cestus gloves with long cuffs were essential. My xmas present of a Home Depot card had Santa’d my burly 10amp Bosch grinder with vibration dampening, which proved up nicely. I returned the next morning and had it all finished by 11am. Each run of pipe is just under four feet long. This should be noticeably smoother under load. Fitting the tubing was the technical part. We cut the tubes a bit long, then I ground out the old welds on the giant I-Beams, then cut and ground down an end until the pipe was just just too long to fit. Then I whanged it into place with the sledgehammer (visible btwn the 2nd and 3rd rail). This assures that I’m putting structure back to the buttressing pipe and supporting the platform above, rather than the weld pulling against the sidewall, which would also increase the likelihood of the weld shearing under load stress. Make art? or even Art? I’d rather grind a bumper. 8 years ago I did a rust triage on the rear bumper; now the surgery is a bit more involved. When you finish a two day rust triage on the big deer bumper up front, it is tempting to forget the sad rusty bumper on the back. It is so small though. And so so rusty. I bet you could just pop it off and make a light day of it in the shop. Sure. Let’s do it. and that’s how I got my tennis elbow back. The bolts were seized with rust, but wd40 and a wire brush was joined with steel tubing leverage on the end of a wrench- backing off for cleaning then pushing forward, then back, and no bolts sheared ( and no tools died) but my knuckels did get a bit bloody. I used a spring hammer while wishing for a needle gun, then a wire wheel on my big grinder, then a right angle pneumatic with a 30 grit disk to reach all the inside corners- then a heavy duty grind just to smooth things out a bit. I stopped short of sandblasting the whole thing. A bit of ball-pein hammer to press out a dent from the back side as well. The next step is degreasing and etching. The metal turns to a zinc oxide, which seals the metal. The zippy marks along the midway portion are the only places the paint was still good; I cut the surface of the paint to help the new paint adhere. POR15 layer went over the etched metal, then after 3 hours of drying when it was just past tacky, I finished it with a por15 brush-on layer of textured rubbercoat for lining truck beds. I did a small triage on the tow rig and the bumper arms as well. Reinstalled, and with another rubber-coat layer. I also did the front bumper, but it was in comparatively great shape and didn’t need to be removed. The back side was a tough prep job, but goggles and a dust mask and a full tyvek head cover helped. 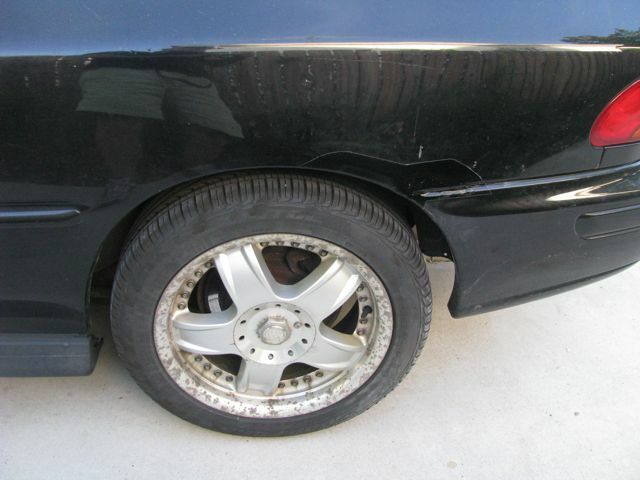 The bottom facets, and anything facing the front wheels was compromised with thick rust flake. The only facet not facing the wheels is the logo, everything else is ground out and redone in por15- even the top of the bumper was beat up from under the front fender out to the tubing rail. I put on a final coat of por15 rubberized spray-coat to help defray Montana road rash. I sprayed under the front wheel wells too. Isn’t That Your Wife’s Car? 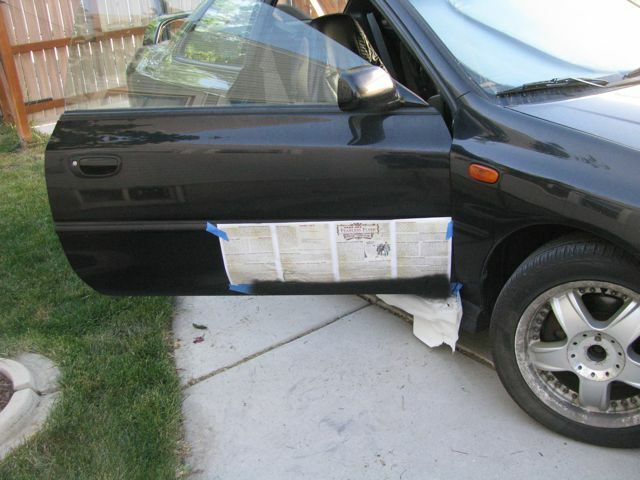 The other side may have been worse…here is a blown-out fix from many years ago on the rear passenger side: non-matching black paint, no topcoat, hard tape line, rumply body fill, rusted out from the back. I have already redone the driver side, and had a learning curve over there on blending the body work (no skin coat, so still lumpy) and painting (too thin on my layers, so there is crackle). Doing it right requires removing the wheels and grinding out the dead metal inside the wheel well and out, then sandblasting, then rebuilding the surface. I decided to go with the POR-15 system to seal and rebuild. POR-15 requires chemically etching the metal to cure the surface and allow the polymer coating to adhere to a chemically altered steel surface. This is the best method for keeping rust from returning, and the rather lengthy and problematic process dovetailed with my patina work on bronze- the logic behind it is much stronger than other systems. The polymer surface can be painted with other matching polymers from the POR-15 catalogue, and recently they added a primer coat that allows body paint. So I ordered in the matching Subaru pearl black and clearcoat. Look for a daily-driver Suby from the 90’s, and you’ll probably see this wheel-well issue. This is my first run at the whole system, the finished drivers side, an embarrassment aesthetically, but solid on the rust triage. The entire inside of the wheel well is now POR-15 to metal, with their rubberized coating as an over-layer. 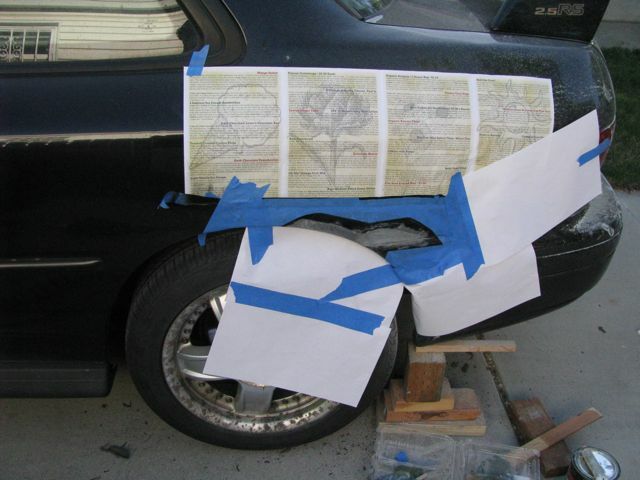 All the body work is done with a polymer putty that does not absorb moisture like a paste i.e. Bondo. Figuring all that out is part of the bad surfacing, and the rest is just gaining experience. After I thought I’d fixed the area, this original paint shattered off of the car due to my use of wood shims to hold the rubber trim out from the panel. I used foam shims from then on- a suggestion of Elizabeth’s! The windshield is to the L, and had a lot of rust along and under the rubber seal to the windshield (yellow tape marks the worst of them). 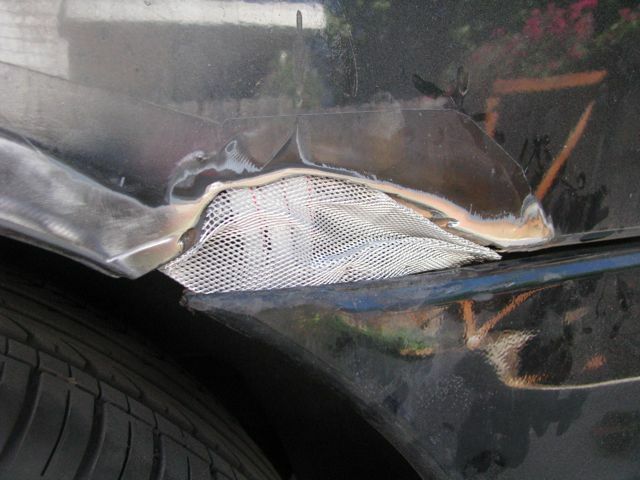 Many rock chips had blossomed much more widely than it seemed from the dimples in the paint. Once I started grinding them out, I saw that the triage was going to be vast. The marks along the rest of the roof and sunroof are from bird poops. Bird poo is like Alien blood, it etches in and burns through to the metal. Another view of the windshield roof line, the pink and black area under the yellow tape has been etched and is turning the metal peacock and the rust to black. This was a dimple of damage from bird poo that erupted under the paint. Now etched and ready for polymer. The rubber windshield barrier is lifted with foam shims made from our work-out mat. This will take a few days of curing the polymer, and moving the shims for new polymer. 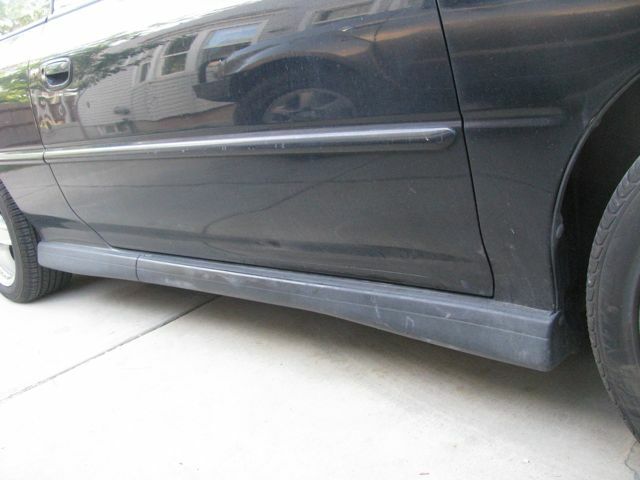 All the black is the polymer, and the white rings around it is the car’s primer coat. The polymer is a brush-on, and needs a bit of sanding after it cures. It cures nearly as hard as metal, and much harder than the auto-paint, which makes sanding it a problem. These are nearly all of the bird poos. I thought I’d do them first. Taped off and the car bagged out in plastic. 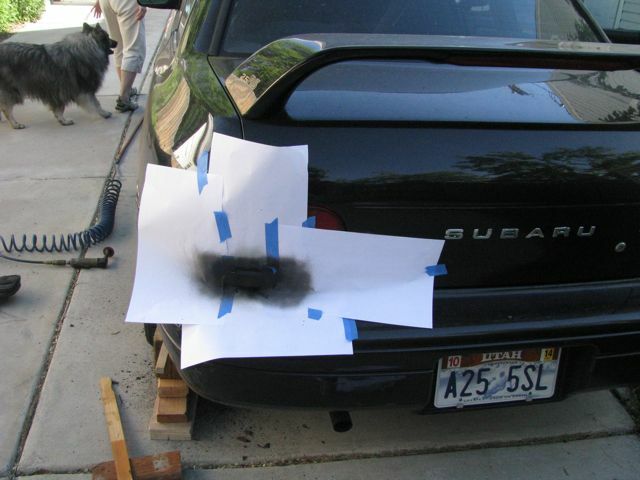 I had this idea…direct the spray paint in a smaller area. It worked well at first, but loaded up with runny paint and had to be tossed. While it worked it was pretty trick- but burned through the paint as well. Three layers of POR-15 primer coat, with some soft and hard edges to blend out. This is what the tube allowed- focused spray layer out to a dusting allowing a hard tape line thin enough to sand out after peeling back the tape. Sanded smooth and ready for new tape. The black under the clear-coat is the POR-15 bulge- and the trouble I had sanding it flat before the primer coat. Anything you don’t get perfect always shows up on the next layer, or the next. I use a thin frog tape to minimize my paint lines. I’ll be wetsanding the entire roof, as it is in pretty rough shape, and hope I can blend it all. Tape removed and the topcoat will cure for two days at least before wet sanding. I’m getting braver about sanding the car and will sand the entire band between the windshield and the sunroof, and paint and clear coat the entire portion. After rough-sanding with 600 grit, I have to primer coat the POR-15 so it can accept auto paint. I include the worst corner of the sunroof as well, and spray it on in three layers creating fairly heavy tape lines. The heavier primer layer allows me to smooth out bumpy issues with the POR-15 with more wet-sanding. 4 layers of color coat and 5 layers of clear coat. Set to cure. This run of door panel was a mess, and I included it as well. With sanding, the matte finish of the clear coat will go shiny and I hope it will blend. While I’m waiting for the roof to cure, I fix deep scratches on each panel bordering the trunk. 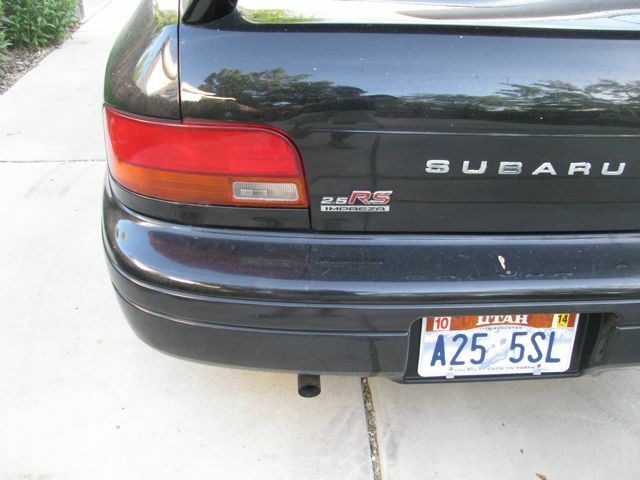 I think the original owners put a tie-down ski rack on the car. This side came out flawlessly (it was in line with the blue reflection). This side was my first attempt, and still shows some damage. However the mirror-level reflection of the wet sanding corrected the slight permutations in the original paint. Here is the area between the windshield and the sunroof, sanded and buffed out. This is the rear panel I started with, that has the issues. From a step away they blend in. This is the improved technique on the passenger side rear wheel well- from a step away. Here is the much better body work- this angle gives a clear unblemished line over the fender. The paint is layered much better and blended nicely compared to the other side. The windshield is to the R, the clouds reflect on the roofline. You can see a few areas of the POR-15 near the rubber border that I could not sand down perfectly without ruining the rubber (or removing the windshield). Here is the rest of the roof. Some areas blended in perfectly, and others remained a bit hazy- this is from my spray paint having a bit of orange-peel, and not wanting to strip through the original clear-coat. So I backed off on perfection and accepted it as markedly better. This is a bird poo on the trunk that spanned the seam line. I wet sanded on the L side of the seam and just buffed on the R side. The wet sand removed it. The original clear coat is not at all consistent across panels and pillars, I burned through in one small spot on a pillar and so take a lot of “fixables” as fixed problems to allow. This is the drivers rear wheel panel again, showing that the earlier image discussing how bad it is may not be quite as bad- as that image captured it at its very worst angle. Inside the trunk is also all new. There was an issue with the drain plug under the spare tire that led to a long triage with POR-15, rubber coating, and creating a new cover panel for the spare to match the old water damaged one, new carpet, and a sound baffle. And now you can open it with the key again. Plus new speakers. 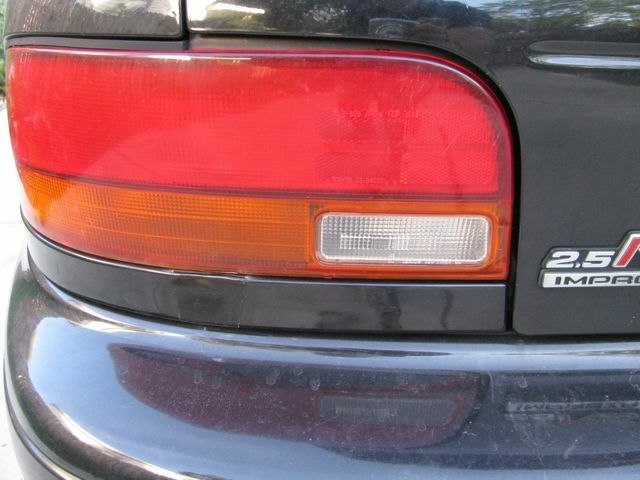 Look at any Impreza from the 1990’s and there is probably rust behind the rear wheels, along the bottom of the doors, and assorted little mystery spots. Here I have cut out a section of rust_rot. 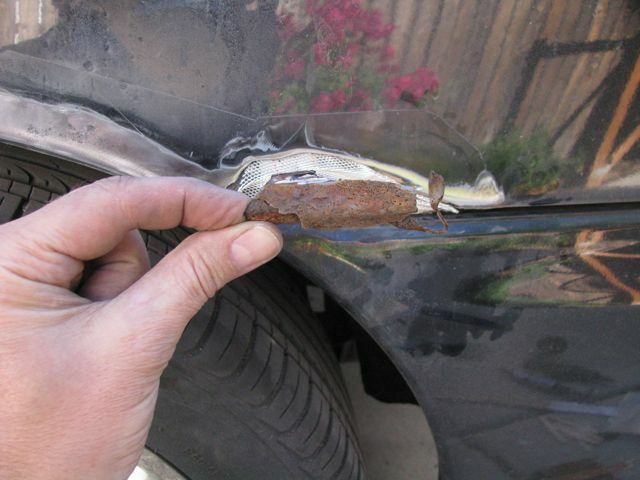 E noticed it when a fin of metal protruded after she power washed her car. Here is a chunk of the rusty mess that was cut away. The first image shows the aluminum screening fit to the hole, with straws behind it to pull water from the wheel well. This is after bondo and grinding and smoothing the bondo, then prepping for paint. Better than a big rusty hole. Triage always leaves fine scarring. The underside of the passenger door was blowing out as well. It was just a matter of grinding back to clean metal, base coat, and topcoat. easy. This is a spot that returned, so redo grind/paint. You have to get pretty close to see it, and know where to look.